Data security is not an IT issue, but a business imperative. As we see more and more media coverage of data breaches and security incidents, the inevitable question is: "What are we doing to make sure that doesn't happen to us?" One of the biggest challenges organizations face is how to identify and protect sensitive and confidential information. Understanding, knowing and identifying your information is the foundation for data security. 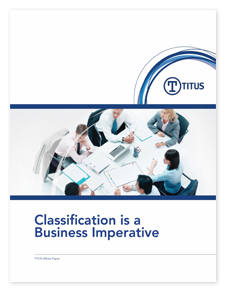 By making classification the first step of your information security strategy, your organization will benefit from increased security awareness, more effective DLP and IRM systems, and better protection against data loss. Download this whitepaper today to learn about data security treads and how you can implement – and enforce - a successful data security strategy in your organization.